A New Year brings colorful celebrations, a spectacular supermoon, frosty weather, and more. 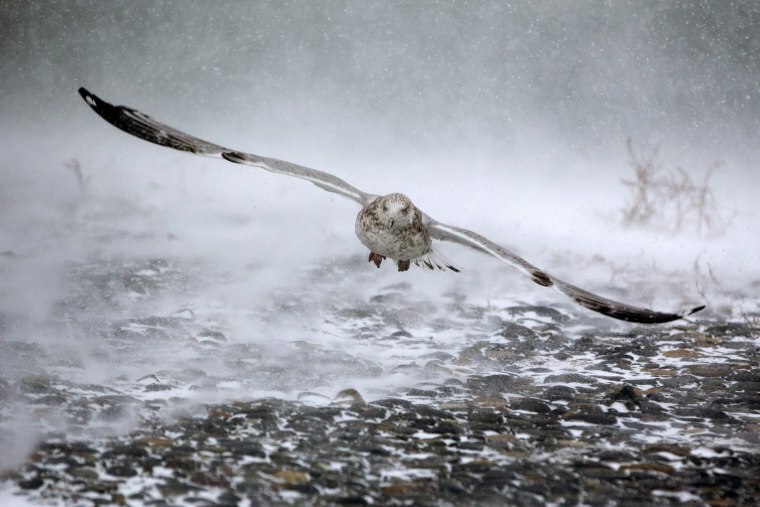 A seagull takes flight in high winds and blowing snow as a massive winter storm begins to bear down in Hull, Massachusetts on Jan. 4, 2018. 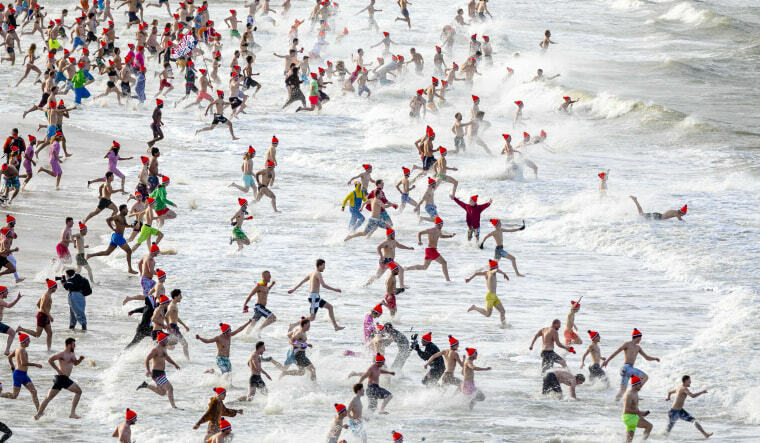 Swimmers run into the North Sea on New Year's Day in Scheveningen, Netherlands on Jan. 1. 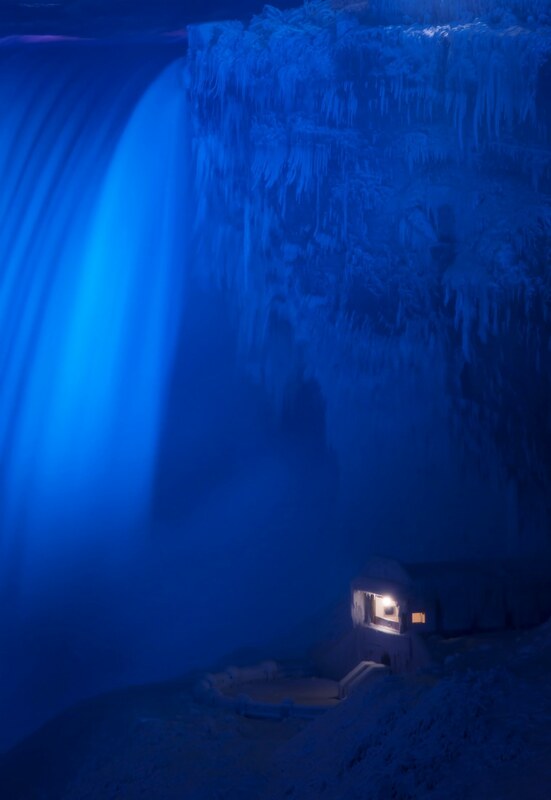 A building covered in ice sits at the base of the Horseshoe Falls in Niagara Falls, Ontario, Canada on Jan. 2. Mist from the waterfalls has been freezing instantly, coating trees, walkways, cliffs and overlooks in a dreamy, brilliant white. 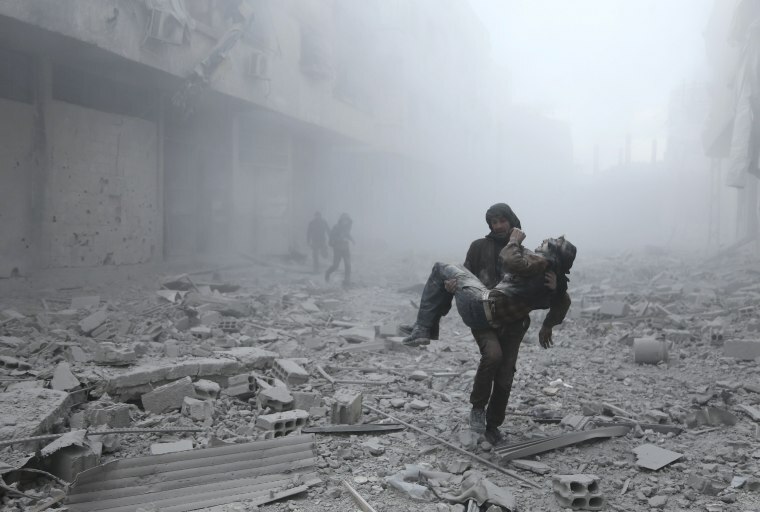 A wounded man is carried following an air strike on the rebel-held besieged town of Arbin, in Ghouta, Syria on Jan. 2. The Britain-based Syrian Observatory for Human Rights said three days of violence in the suburbs of Damascus known as eastern Ghouta has killed 35 civilians, as well as 24 government troops and 29 insurgents. Camels walk across the Liwa desert during the Liwa 2018 Moreeb Dune Festival in the United Arab Emirates on Jan. 4. The festival includes races and other activities that promote the country's folklore. Georgia linebacker Lorenzo Carter blocks a field goal attempt by Oklahoma kicker Austin Seibert during overtime in the Rose Bowl NCAA college football game in Pasadena, California on Jan. 1. No. 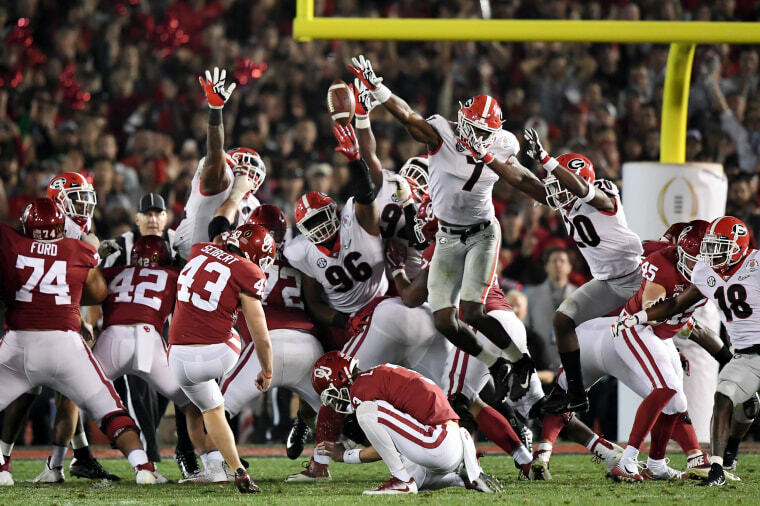 3 Georgia won the first overtime RoseBowl in a 54-48 victory against No. 2 Oklahoma, sending the Bulldogs to the College Football Playoff championship game. The Bulldogs will play either Alabama or Clemson on Jan. 8 for the national championship in Atlanta, about 90 miles from their campus — with a chance to win their first national title since 1980. 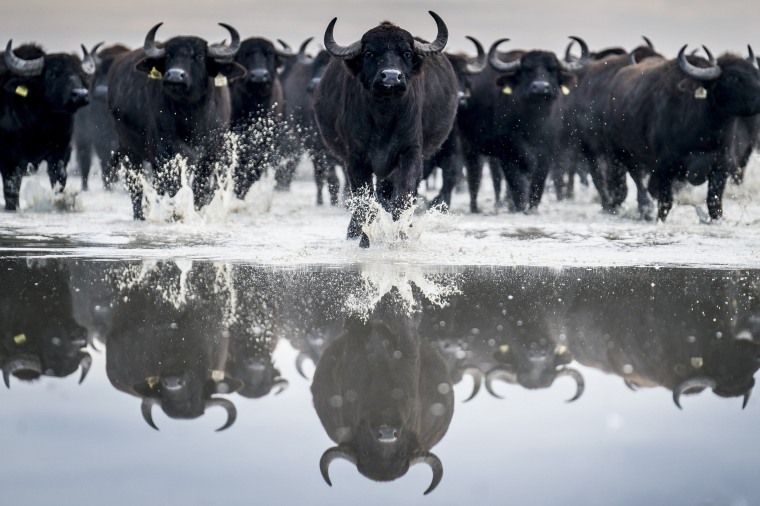 A herd of about 120 buffaloes are taken from their winter habitat in Kiskunsag National Park to an animal farm in Fulopszallas, Hungary, on Jan. 4. A full moon rises over El Capitan in Yosemite National Park, California, on Jan. 1. 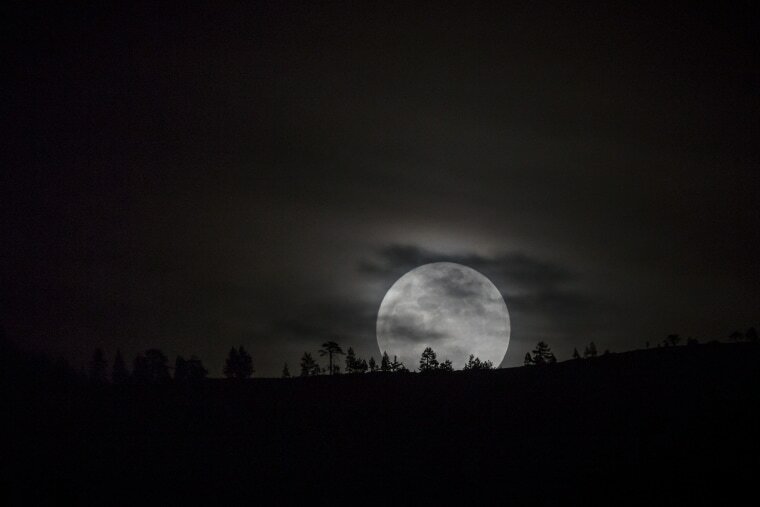 The supermoon, which occurs when the moon's orbit when it is closest to Earth, was the first of two that will occur in the month of January. A university student attends a protest inside Tehran University as a smoke grenade is thrown by anti-riot Iranian police, in Tehran, Iran, on Dec. 30. 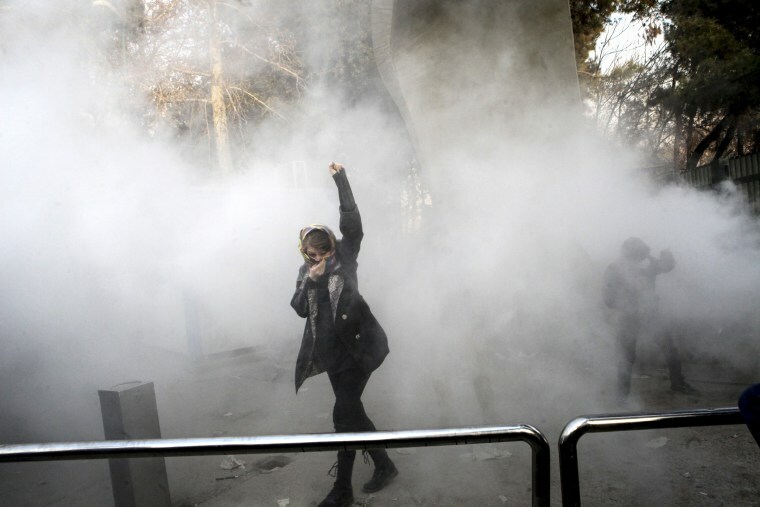 A wave of protests over Iran's weak economy swept into the capital over the weekend, with college students and others chanting against the government just hours after hard-liners held their own rally in support of the Islamic Republic's clerical establishment. 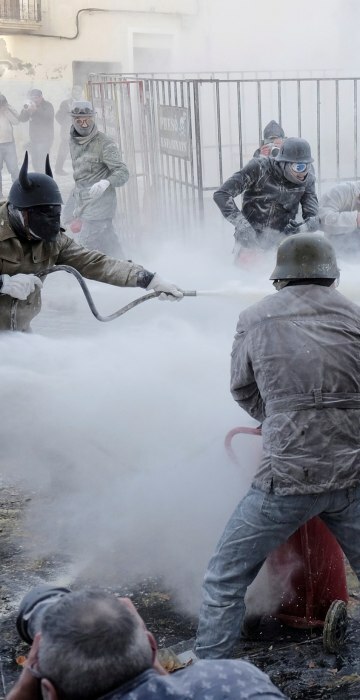 More than 20 people are reported to have died in the protests, but there have been no reports of a widespread, violent crackdown by the government. 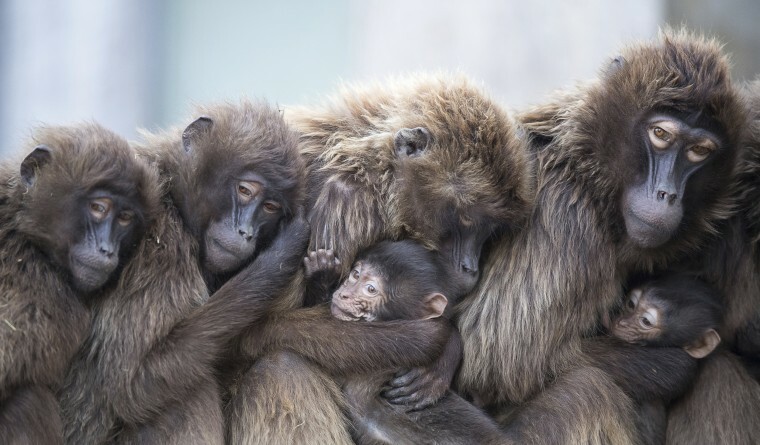 Female gelada baboons cuddle with their offspring to keep warm at the Wilhelma zoo in Stuttgart, Germany on Jan 3. 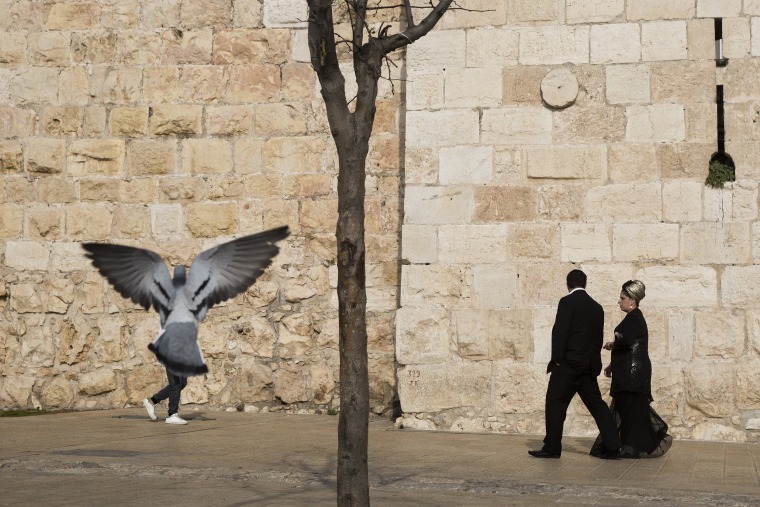 People walk along Jerusalem's Old City walls, next to Jaffa Gate, on Dec. 23. Jerusalem's iconic Old City walls have been a symbol of the city, and successive waves of conflict surrounding it for centuries. But in the shadow of the walls, a rich daily life flourishes. This image was released by the Associated Press on Dec. 29. 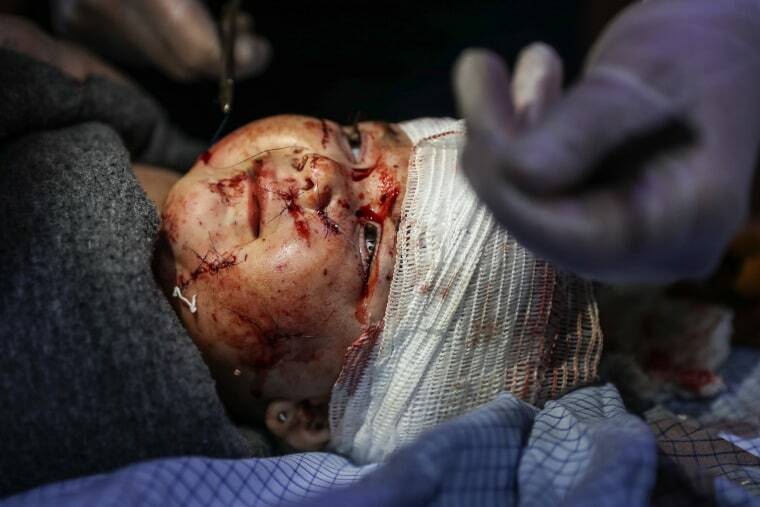 A young girl is treated at a hospital after a bombing in eastern Ghouta, a suburb of the Syrian capital Damascus on Jan. 3. According to Reuters, residents and a war monitor said bombs from suspected Russian jets killed at least 20 people in a suburb of Damascus. 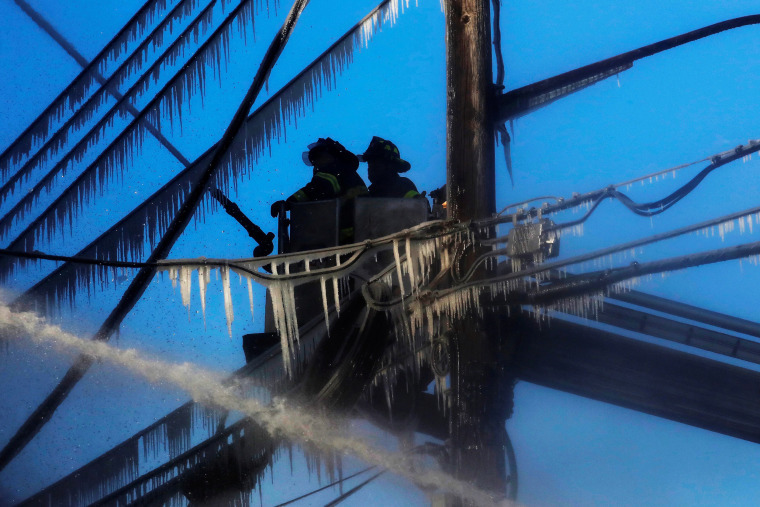 Firefighters work at an apartment building in the Bronx, New York on Jan. 2. The FDNY said 23 people, including a firefighter, were hurt. The blaze came days after the deadliest residential fire to hit New York City in at least a quarter century killed 12 people in a Bronx apartment building. 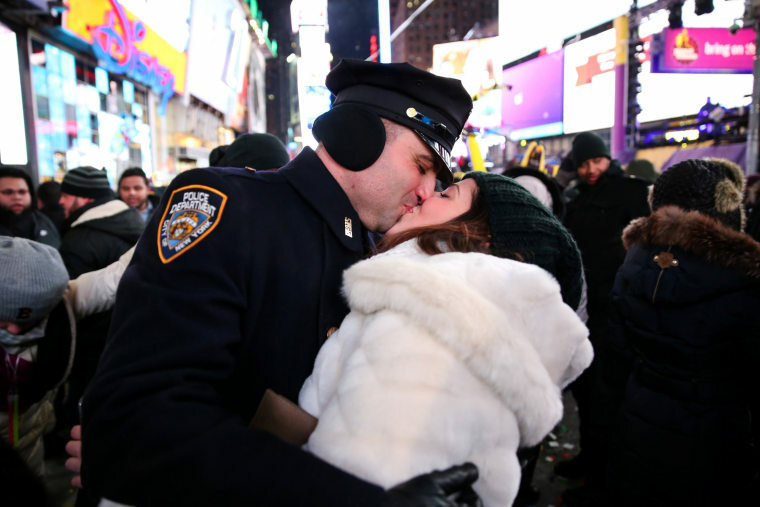 A New York City police officer celebrates the New Year with a kiss in New York's Times Square on Jan. 1. Times Square had the second-coldest New Year's Eve celebration on record and coldest in 100 years with temperatures dropping to nine degrees as the ball dropped. 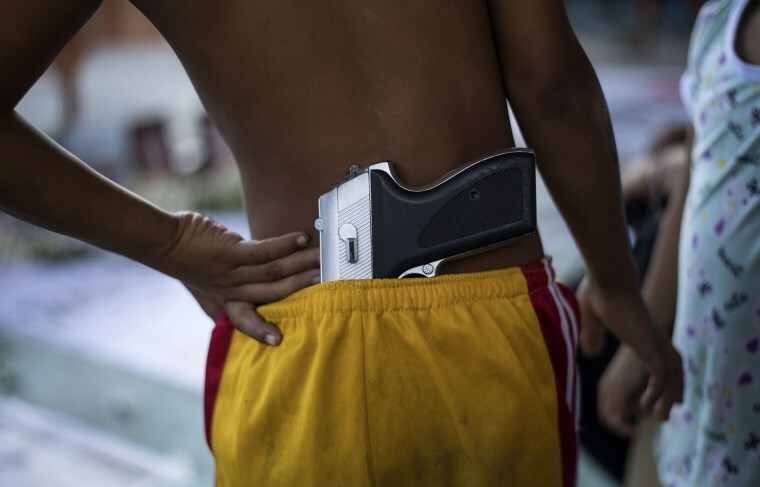 A boy listens to a prayer as he and relatives visit the grave of loved ones killed during the government's war on drugs campaign, at the Tala Cemetery in Caloocan, Philippines on Dec. 28 for Holy Innocents' Day. 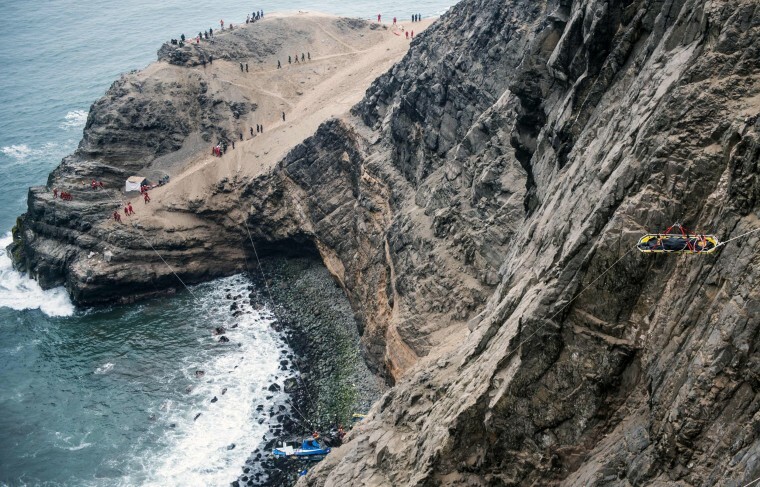 Rescuers at the scene after a bus tumbled down a cliff onto a rocky beach along a narrow stretch of highway known as the "Devil's Curve" in Pasamayo, Peru on Jan. 2. The bus carrying 57 people was headed to Peru's capital when it was struck by a tractor trailer shortly before noon and plunged down the slope. 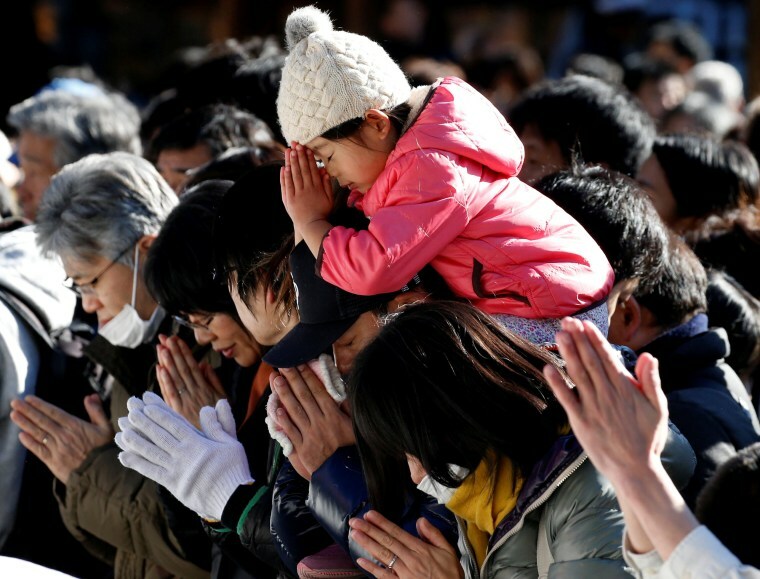 Worshipers offer prayers on the first day of the new year at the Meiji Shrine in Tokyo on Jan. 1. 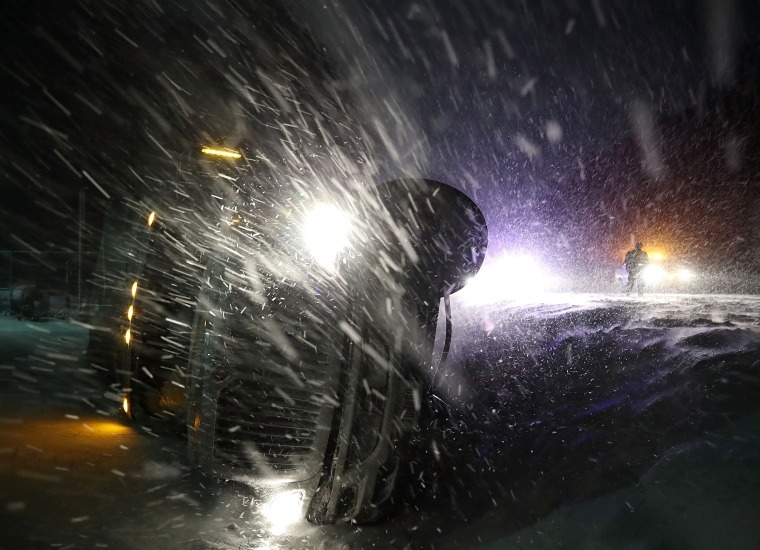 A tractor trailer lays on its side after running off the road during a snowstorm in Georgetown, Delaware on Jan. 4. A deadly winter storm crawling up the East Coast clobbered the Northeast on Thursday with blinding blizzard conditions and coastal flooding, which snarled travel and left millions of Americans bracing for potential power outages. 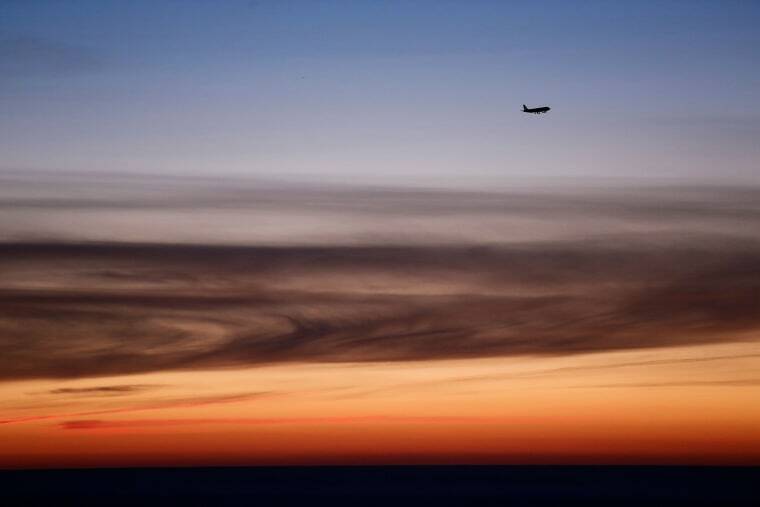 A plane prepares to land at Barcelona airport during sunrise on Dec. 31. 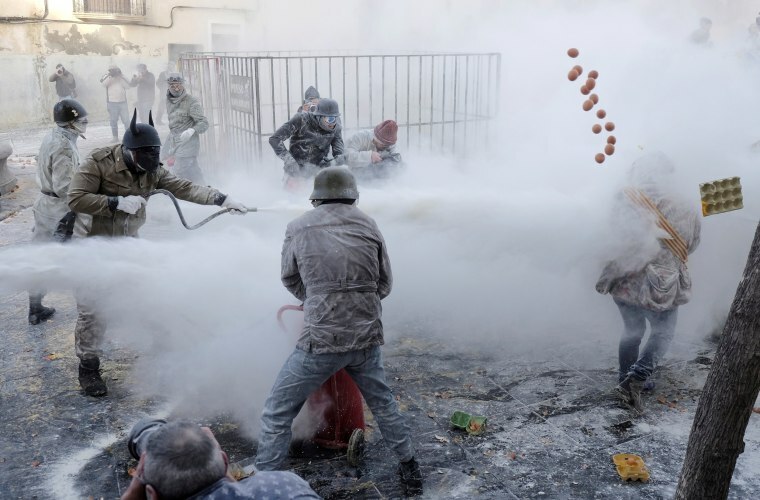 Revelers dressed in mock military outfits battle with flour, eggs and firecrackers during "Els Enfarinats" in Ibi, Spain on Dec. 28. The 200-year-old tradition stages a fake coup d'etat outside the town hall in celebration of the Day of the Innocents. 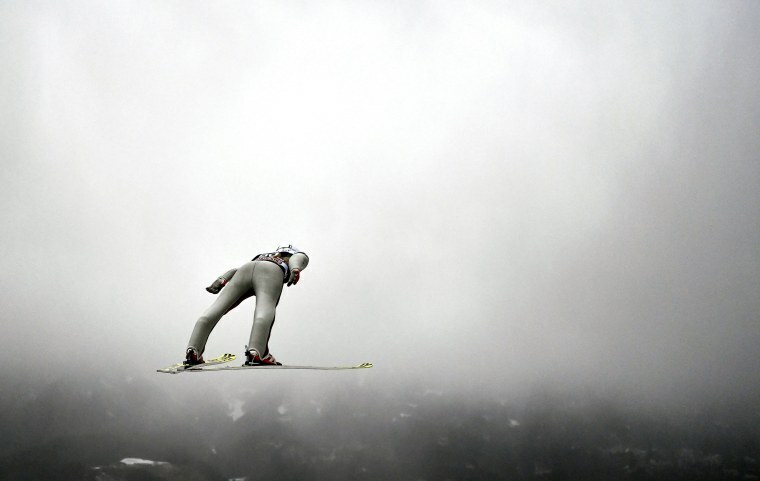 Norway's Anders Fannemel practices for the third stage of the Four Hills Ski Jumping event in Innsbruck, Austria, on Jan. 3. 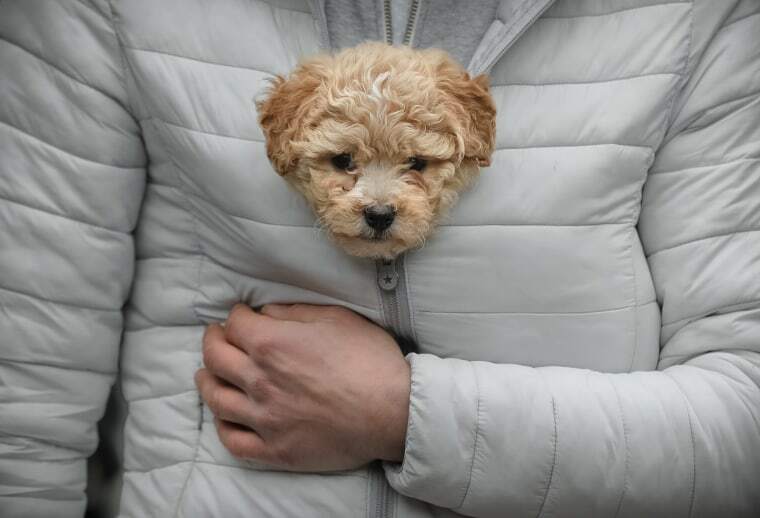 A man keeps a puppy warm in his jacket while watching a New Year's parade in Comanesti, Romania on Dec. 30. 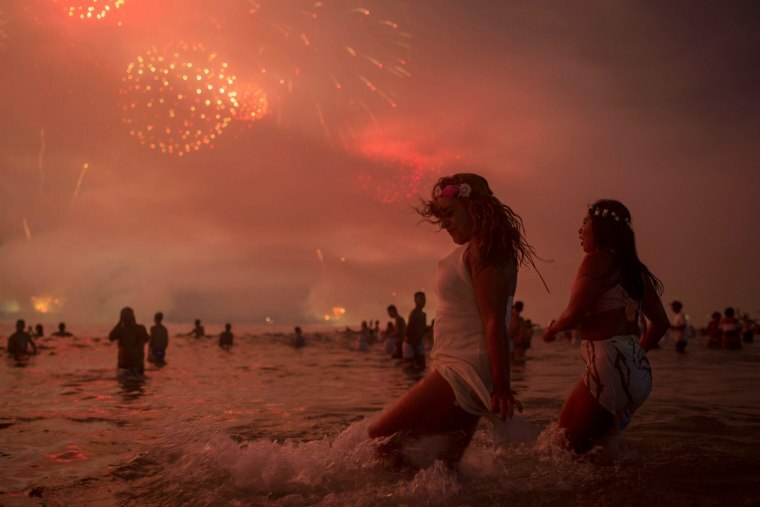 People watch fireworks during New Years celebrations at Copacabana beach in Rio de Janeiro on Jan. 1.